Rock fans are also not done out of their share of the slots symbols. Everybody welcome - Osborne's household you will see not only on the TV shows, this gothic creature captures also the world of gambling. How would we play without him? For somebody kitty rose light symbols are the favorite, but here near the one-armed machines you will see all the members of the dark subcultures, who perhaps even wouldn't come here, if there hadn't been the machine with the Osborne's symbols on it. The Osbourne symbol. Imagine, what traits has this omniscient face on the screen of your game? 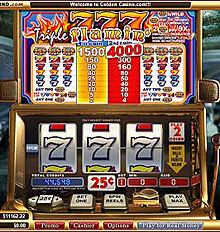 Yeah, it's the most powerful of course and can substitute any other symbols of this gambling game, being wild among the slot terms. Scatter symbol of this ridiculous game carries the name of Mini. But you will have the payout, only if you get 2 or more of this symbol on a reel. When you have the Knocker scatter symbol on the reel in the position of 3 and more, you will have the other payout. The free spins are present here too. Osbourne isn't so avid; he can give you this feature if you come across the Mini symbol again. You will have the Knock Knock extra game if you encounter the other scatter symbol of the Knocker, which can congratulate you with such a bonus. While playing this gambling slot type, you won't only observe the typical rock symbols; you also have a great opportunity to win a lot. How to do this? Just simply find as much as possible of Minis symbols, not paying attention to the position which can be present on any of your reel shown on the screen, thus you will have not only the 10 free spin tours, but also you will catch your prize doubled! 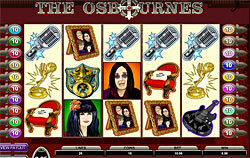 Who is not aware of the Osbournes household? You have already met only the main symbol of king of heavy metal and also the scatters of Mini and Knock. But what about the others? You will meet in this Microgaming gambling 5 reels, and not only three symbols will be on the 20 paylines, giving you the chance to get 34 combinations of winnings. Sharon, Jack, Kelly as a part of this strange and contradiction family will also surprise you on the reels as well as the integral symbols of Guitar, Microphone and plus amazing Red Armchair. But you are already aware of the symbols that can bring you the trophy, so these ones are not so important, isn't it unbelievable? Just consult the pay table; you will get known all the tricks that it can share. What you have to do is to trigger the maximum amount of 100% and in such a way you will have the great and high opportunity to get the jackpot of 15000 coins. Enjoy this coin-based gambling and you will be impressed of plenty of bright or maybe a little bit dark and inapprehensible feelings!